Jim was right. 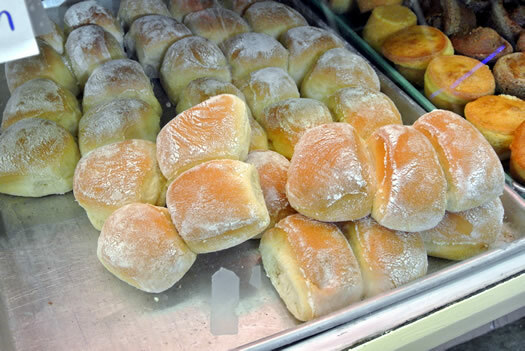 The snowflake rolls -- really, all the dinner rolls at Schuyler Bakery -- are prime examples of what a dinner rolls should be: chewy, but light. Substantial, but not so filling you don't have room for the rest of dinner. The yeast lends a slightly nutty flavor to the dough, and many local restaurants would be wise to include some of these rolls in their bread baskets. But let's talk about the Paska bread. You can find it mostly around the holidays and Easter. It's an Eastern European classic (though some attribute it solely to Poland) that has made its way westward alongside emigration from the former Soviet bloc. Paska bread is not much different that a brioche or challah, but is much lighter in texture; nearly cloudlike, save for the speckling of raisins in the loaf. 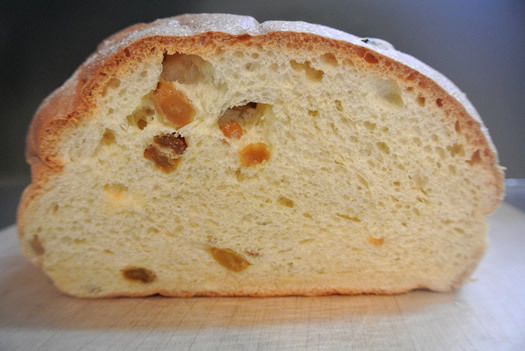 One way that Schuyler Bakery differentiates its paska from other local varieties is its exclusive use of golden raisins. Some bakeries use only black raisins, other might use a blend of black and golden, but Schuyler claims it is the only local retail source for golden-only. That might not seem like a big deal, but golden raisins are substantially more expensive that their black counterparts. And the golden raisins impart a sweet-like-honey succulence and more delicate flavor and texture. 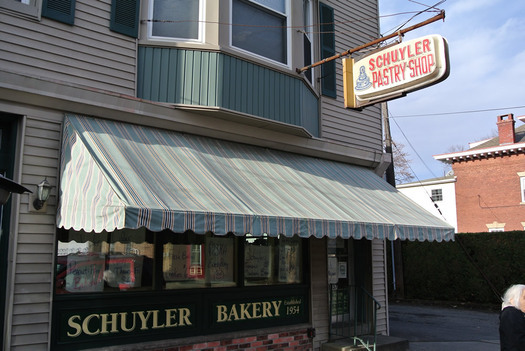 It is touches like this that set Schulyer Bakery, in operation for more than 60 years, apart from its competition. 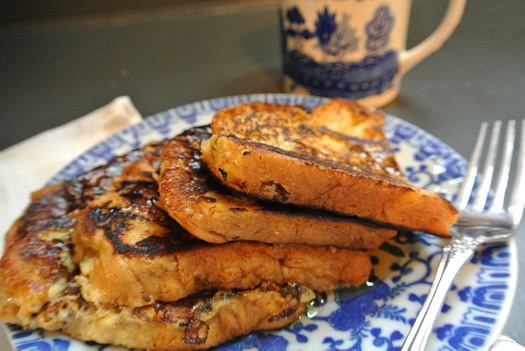 French toast made with the Paska bread. Paska bread on its own is a supreme example of a sweet, eggy breakfast bread perfect for toast -- just a little butter on top is all that is needed to complement that morning cuppa coffee. The subtle sweetness lends itself well to breakfast. But the impeccable light crumb of the bread begs to soak up a custardy mixture of cream and beaten eggs (seasoned with a little cinnamon, nutmeg, a pinch of salt and vanilla extract), then pan-fried in a few pats of butter for exceptional French toast. If you have the chance, grab a loaf ($5 for a medium loaf, $10 for large) and prep a batch of bread pudding for Christmas morning. 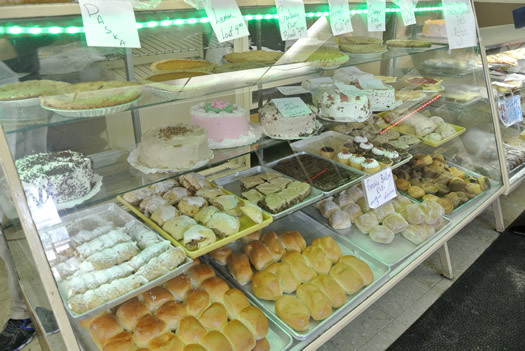 Of course Schuyler Bakery is beloved by many for its other offerings, like cookies, donuts, and cakes -- people have been coming for generations for the beyond reasonable prices, generous portions, and friendly faces behind the counter. But don't overlook the loaves of Paska hidden amongst the vibrant sprinkles and mountains of frosting that line bakery shelves and deep windowsills. It's a simple way to add a little something special to your daily eats at the holidays... or just because. Thanks for great public service in bringing this to our attention. That sound you hear is me starting up my car, on my way to Schuyler Bakery for Paska Bread. Their cinnamon bread is divine. Makes the best Christmas morning french toast. Ate a whole Paska bread last night thanks to my neighbor who was nice enough to get me one. so soft and yummy raisins. Everything at Schuyler is yummy! Still waiting for the dozen donuts review of Schuyler. I second that Jamie - the cinnamon bread is amazing; I ate a whole loaf in a day and a half. plain, no butter, nothing. It has a crunchy outside (top, bottom, sides) from the layer of cin/sugar and lots of nice swirl inside too. Addicting!! !